Bangalore: Indian firms are back on the prowl. After a lean period of two years, mergers and acquisitions (M&A) by local firms are set to increase by 40% in 2010, a prediction based on deals investment bankers and advisers are working on. Eleven investment bankers and deal advisers Mint spoke with said Indian firms are mainly searching for overseas targets to boost both growth and resources. This would trigger acquisitions primarily in oil and gas, metals and minerals, technology and telecom, mostly in Africa, Europe and North America, they said. “A lot of Indian companies have strong balance sheets. They have the ability to strike deals," said Sanjay Thakkar, head, transactions and restructuring, KPMG India Pvt. Ltd. “European companies have taken longer in recovering from the slump. And many European and North American groups are looking at dispensing their non-performing, non-core assets." Reliance Industries Ltd, for instance, is trying to buy bankrupt Luxembourg-based petrochemicals firm LyondellBasell. Reuters reported this week the deal is unlikely to be finalized in 2009 as LyondellBasell is still evaluating its options. Several Indian IT firms, too, are looking to buy companies in North America and Europe as they try to secure high-value government contracts coming up in those countries. Other companies are looking to South American nations such as Chile and African countries such as Zimbabwe for firms owning iron ore and coal mines. “In the first six months, three-four big-ticket deals ranging upwards of $250 million (Rs1,170 crore) may get announced," said Ranjan Biswas, partner and national leader, transaction advisory services, Ernst and Young India Pvt. Ltd. “They would be in real estate, infrastructure including power, and housing, oil and gas." 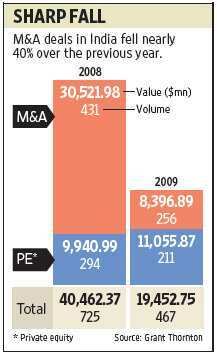 Mergers and acquisitions involving Indian firms had slowed considerably in the past two years from the peaks of 2007 because of an economic downturn. In the first 11 months of 2009, M&A deals in India fell nearly 40% over the previous year to 256, according to data from Grant Thornton, an advisory firm. The fall was sharper in terms of value, declining by around 72% to $8,396.89 million. But India’s economy recovered faster than most developed nations, growing at a better- than-expected 7.9% in the July-September quarter and has seen rising at a similar pace in the latest three months, which has boosted the morale of corporate houses and investors, say experts. Also, many of the country’s top 50 companies by market value have achieved scale in India and are looking to replicate that globally, they said. “There is a strong trajectory and I believe that deal volumes and deal values would be stronger than 2009, but it’s too early to say if it would reach the 2007 level," said KPMG’s Thakkar. With overseas markets trading at a discount to India and financiers more eager to fund Indian firms, the country is likely to see a spree of cross-border acquisitions, say experts. “One key M&A activity driver will be P-E (price earnings) multiple arbitrage, something which will allow India Inc to buy into the G3 markets (Japan, the US and Europe) without these acquisitions being dilutive," said Tarun Kataria, managing director and chief executive, global banking and markets, Hongkong and Shanghai Banking Corp. Ltd (HSBC), India. “The other, of course, is the availability of financing." Kataria said 75% of HSBC’s pipeline of deals by Indian companies is outbound. He added that most of the deal activity involving Indian firms will be in the range of $200 million to $1 billion, though this could vary considerably if there is any further economic disruption again, such as the Dubai debacle. Late November, Dubai had requested a standstill on $26 billion of debts linked to Dubai World, its flagship financial arm, and its property units Limitless and Nakheel, which are developing three palm-shaped islands in the emirate. Experts says that while Indian companies may be in a position to successfully pull off overseas acquisitions in the current market environment, raising funds could still be an issue. Meanwhile, foreign companies, too, are looking at getting at a foothold in India. “India is an important market for international corporates. We are seeing greater interest from strategic players because exposure to emerging markets such as India is becoming a priority for them," said Falguni Nayar, managing director, Kotak Mahindra Capital Co. Ltd. The foreign firms, however, may not pick a majority stake but acquire small holdings just enough to give them an entry into Indian markets, she added. According to some other advisers, India’s pharma industry is touted to be the hottest sector in 2010 with regard to domestic, inbound and private equity deals, as foreign firms looking to enter the generic drugs space. “There are too many pharma companies and they need consolidation. Overseas players would be active in acquisitions in this sector," said C.G. Srividya, partner, specialist advisory services, Grant Thornton.